Rambo punishes the wrongdoers. If people would only behave themselves and act nice, Rambo wouldn't have to do the mean things he does. He doesn't like to kill people. He has no choice. They deserve it. 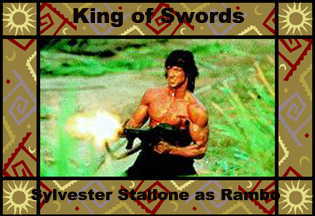 The King of Swords represents the consequences to behavior. Good behavior results in reward. Bad behavior results in punishment. Rambo was meting out punishment at Rambo.